Shortcut virus usually has two forms: Flash Drive Shortcut virus and Folder Shortcut virus. Both two virus would make USB drive or file folders become shortcuts, causing USB or file folder inaccessible with shortcut formats. By this, users would have to suffer serious data loss trouble and even huge economic loss. 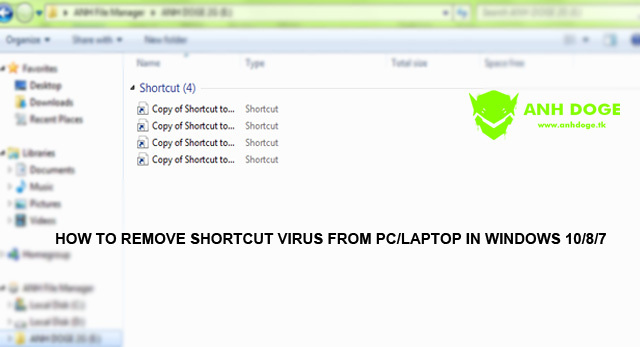 So what to do and how to fix the shortcut virus? Follow to find answers here now. What to do when the computer, laptop, USB or SD get infected by shortcut virus? Hi guys, are you looking for a way to remove and clean up shortcut virus from your computer, laptop, hard drive partition, USB drive or SD card etc devices? 3. Find reliable data recovery software in case of data loss trouble (if necessary). How to remove shortcut virus from PC/laptop on Windows 10/8/7? 3 Methods available to help! 3. Delete/Wipe Shortcut Virus from Registry. You may selectively to follow either one method to get rid of the shortcut virus and restore all data now. 4. Type: attrib g:*. * /d /s -h -r -s and hit Enter. You’ll be able to see your files and data on Windows PC or USB flash drive now. 5. Click OK > Click Restart now. How to recover shortcut virus infected files? After removing the Shortcut virus from USB and Windows PC, you still have last one thing to do, which is to view and restore all lost data due to shortcut virus infection.